What follows is a narrative detailing the way a service project naturally evolved in our community, providing an example of how a service project can take on a momentum that contributes in many unexpected ways. Though not intended as a service learning project, which is most commonly associated with schools, it embraced preparation, action, reflection, and celebration. The comment that caught my attention was, “When a wool helmet liner has been provided to someone, we usually hear back that everyone in the group would like one.” A completed helmet liner was on display at another store, so I took a photo. On the way home, I thought about knitting a helmet liner, as the owner of the yarn store had given me a copy of the flyer with the knitting instructions. The idea I could make this and bring some measure of comfort and an expression of care to an American soldier in a complex circumstance was compelling, so I decided to make one. By December I had completed a helmet liner and was very proud of my new creation. My husband tried it on and it fit beautifully. With some inquiry spread through friends we found that Joe, one of our police officers, was part of a National Guard engineering company headed to Afghanistan. I told him about the project, and he agreed to accept my helmet liner on New Year’s Day. He was unsure of the item, as he had never seen one, and he seemed shy about the unexpected gift. He agreed to put it on, as I wanted to be sure that it fit. Then I wanted a photo. Mission complete … well, almost. I asked how many soldiers would be with him and when he was leaving; he told me there were 180 soldiers in the company, which was departing mid-February. Until then, I had not entertained the idea of outfitting his company. One step at a time, I had arrived in the same inspirational space as the knitters in Vermont, knowing the soldiers would appreciate these helmet liners. Over the next few days, as I toyed with the idea of how to make 180 liners, family members came up with ideas. My husband’s aunt suggested a radio interview, my husband suggested a newspaper interview, my daughter Genevieve suggested making a version of the Vermont flyer with our information and a completion date to enlist the help of our local knitting store. Thank you for taking care of us. It sounds like a cool project. We will definitely be enduring some cold environments between our US training location this February/March and the mountainous regions of Afghanistan next winter. As a suggestion for your flyer, replace “reservists” with “soldiers” because technically we are National Guard and not Reserves (while we are quite similar to our reservist counterparts, we are primarily state run while they are federal). You are correct in stating that we have soldiers from the various locations you listed. We actually have soldiers from 42 of the 62 counties in NY State. We are slated to leave on 21 Feb, which will also be the date of our departure ceremony. The knitters who surfaced were varied. Ella, who was turning eighty-nine, stopped by my house a few times for assistance as she hadn’t knitted for some time. Her daughters were exceptionally appreciative of the constructive activity and community involvement the project added to Ella’s life. There were women who knitted in the evening after work. Sons requested patterns by e-mail for their mothers who did not have Internet access. Some shared the project with family members in other states. A few women from a nursing home and Girl Scouts ages eight to eleven joined in. Charlotte, who had just learned to knit, completed her helmet liner with a bit of help. You’ll be pleased to know that yesterday evening I was working on a helmet liner while commuting home on the train. I had noticed when some “tourists” got on the train and had given them my seat so all four could sit together, and I just scooted across the aisle to where a seat was vacant. After a while, the grandma in the group asked me what I was knitting. So I told her about the project, and she got excited because she is a knitter and belongs to two groups in Maryland. Since I had just been searching the web page for the neck cooler pattern, I had the web address memorized, so gave her that link to look up the helmet liner pattern. Then we exchanged e-mails so I could send her the neck cooler information when I received it from you. 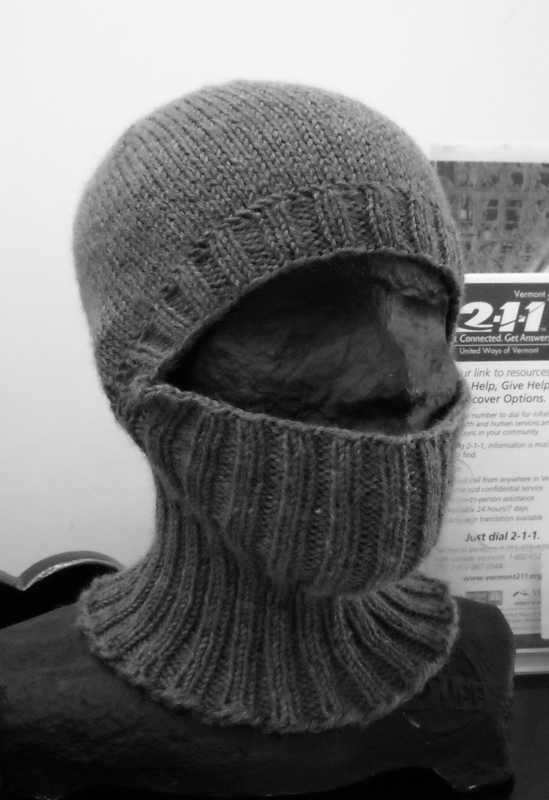 I’ve just ordered 20 more skeins of yarn to keep working on the helmet liners. I assume the charcoal and mocha colors were okay? I really like the superwash yarn, and it is so soft. I continue to knit the liners and will gladly send them to you if you need more. I have yarn for about 12–14, and if there is a need, I’ll get more yarn. I had to wait over an hour at my husband’s doctor’s office, so I sat and knitted. I find that the knitting project is very transportable, so I bring it along just in case I have to wait for whatever. One of the interesting, community-building aspects of this project is that it is supporting small businesses—yarn stores. The knitters are coming to you for yarn, for help, and as a drop-off point. I think this is a valid aspect of the project that should be preserved. I have a rather large distribution list to communicate with all the knitters who have engaged in this project. Before I write to all our knitters, I want to know what your perspective is on this alternative yarn, as I could let them know about this yarn and if you can stock it. All the store owners were happy to comply and joined in the spirit of the project by quickly obtaining the yarn. Another woman whose husband had served in the military contacted me. Her husband was allergic to wool, so she suggested alpaca as an alternative. Although the yarn was considerably more expensive, a few were made. I think it’s wonderful how the community of knitters has embraced this project. It is especially heartwarming to see the looks on their faces when they bring the completed liners in! They are so pleased to be contributing. Inspiration ran high. Charlotte and a few friends helped sort them into containers for the trip to the National Guard departure ceremony. They were excited to report that although they needed just 180, we had 300. At the ceremony I described the project to the soldiers and how the knitters had come together to create the liners by their departure date. The neck coolers were also described, noting that labels with instructions were on each item. We showed additional care for their comfort when I asked if any soldiers were allergic to wool; two raised their hands, so they got alpaca liners. The soldiers lined up to select helmet liners, which varied in color and size. They joked among themselves as they assessed their head sizes in relation to the slight variations in the handmade helmet liners. The company had already packed their gear for transport, but they still had backpacks with pockets that easily accommodated the liners and neck coolers. Their individual comments were very appreciative and respectful of our concern for their well-being. Toward the end of the line, a young female soldier asked if we had any more of the alpaca liners left, and one remained. She explained she had not wanted to openly share a need for this accommodation among her mostly male peers. I just wanted to send you a note of thanks for the wonderful wool liners the upstate NY knitters made for my husband and his fellow soldiers! Knowing that your group of incredibly kind, caring, and dedicated knitters were working this whole time on these terrific helmet liners is such a great feeling. I now really feel like members of our community have been paying attention, and it is terrific that they all care enough to spend the time to make these liners. It really means a lot to the soldiers and their families. As family members, all we want is for our soldiers to stay safe and comfortable. I am relieved to know that the liner my husband has will help him stay comfortable throughout this deployment. I must also share with you that the soldiers are quite impressed that the liners were made to army specifications, as that is quite a task! Thank you so, so much! Please feel free to forward this on to your knitters—they are truly spectacular individuals who have made a significant difference. My experience with the military is very limited. I did not grow up with family who served, so this communication helped to educate me. My education continued when I was contacted by the mother of a marine who had recently deployed. She had seen a news article about the project. I had never heard of anyone making or sending helmet liners before. 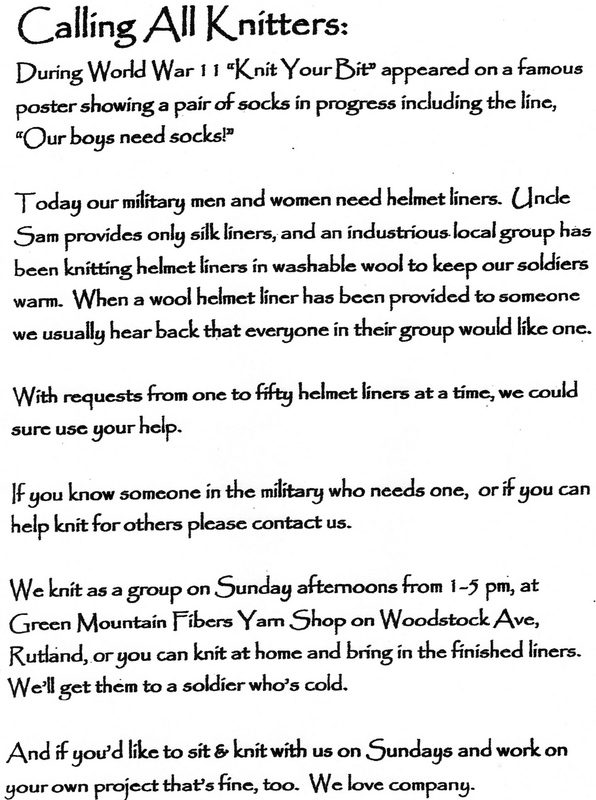 It was so great to hear about this and very generous of the knitters to be doing this to support our soldiers. I do not knit, but I would be willing to help with shipping expenses if you could send some of these liners to my son, age 21, and his platoon. I think they would really appreciate the thoughtfulness and the comfort that the liners would give them. I am sure you have received many requests, but I thought it wouldn’t hurt to inquire. We have been told not to repeat anything that might make their location, maneuvers or company known; anything to do with the size of the battalion or where they are stationed. My son said it is cold now in Afghanistan so the liners will be greatly appreciated. They will be very surprised, I’m sure, and it means a lot to us as parents to be able to send them the liners. Our contact from his camp said to please pass on a big “thank you” from her as well as the company commander. They really appreciate things like this and said they have heard about the liners and have had very positive remarks from the troops receiving them. This is a very hard time for us; having a child in the military and then having to send them off to a foreign country, the unknown. It is a time for us just to reflect on our family as we watch and wait. I appreciate all you are doing and hope you understand. Space available mail is less expensive; packages ship only as space is available in bins upon departure and need to weigh under 15 lbs. Small boxes are shipped more quickly as they fit in remaining small spaces. The total cost to send 140 helmet liners was $21. Cheryl had offered to pay for shipping and sent the address for me to ship the liners to Afghanistan. I suggested that she should have more direct involvement in the process, as she had remarked, “it means a lot to us as parents to be able to send them the liners.” I also knew how inspiring it was to handle so many hand-made items—such an outpouring of giving. She agreed to come get them. Wow … deep breath. You were so right about handling the helmet liners, seeing all the different knitters names, seeing the helmet liners’ instructions … the handwritten instruction tags … the message above. I am overwhelmed. 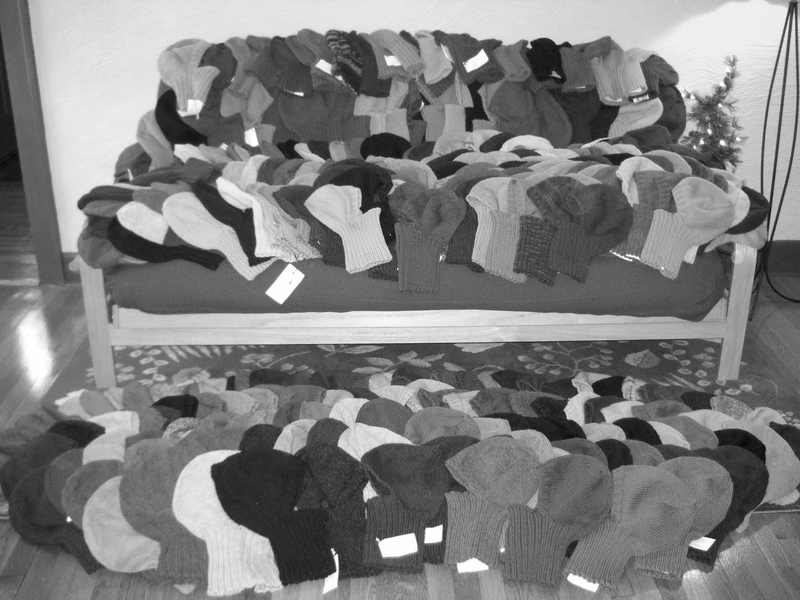 These 100 or more knitters should feel a great deal of pride for accomplishing this. This means so much to the families at home as well as the family member receiving these. Thank you for bringing all these knitters together. 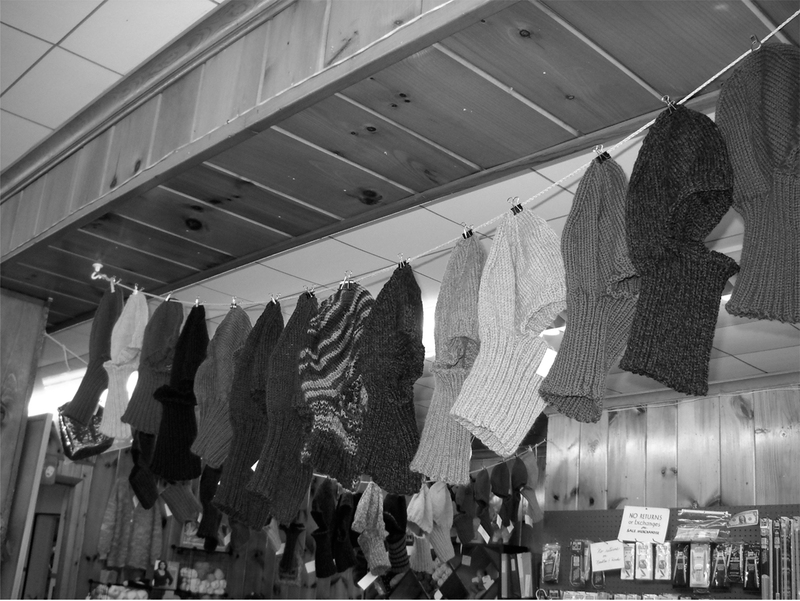 Thanks to all the knitters for the time, money, love, and compassion they put into their work. I felt it all as I held each one and repacked them into the boxes. If you ever wondered if there was enough room in this world to make a difference, I can personally tell you yes. Yes, you can make a world of difference and you have. The helmet liners disappeared in about 15 minutes—all of them. As it is already warming up here, that came as a bit of a surprise. Thank you for the pictures, and thank you so much for taking the initiative to coordinate your own effort for your area. All done within a month or a bit more! I am forwarding this information to my fellow knitters so they will learn how their involvement in this project for our troops catalyzed others to use their skills to help and honor our soldiers. 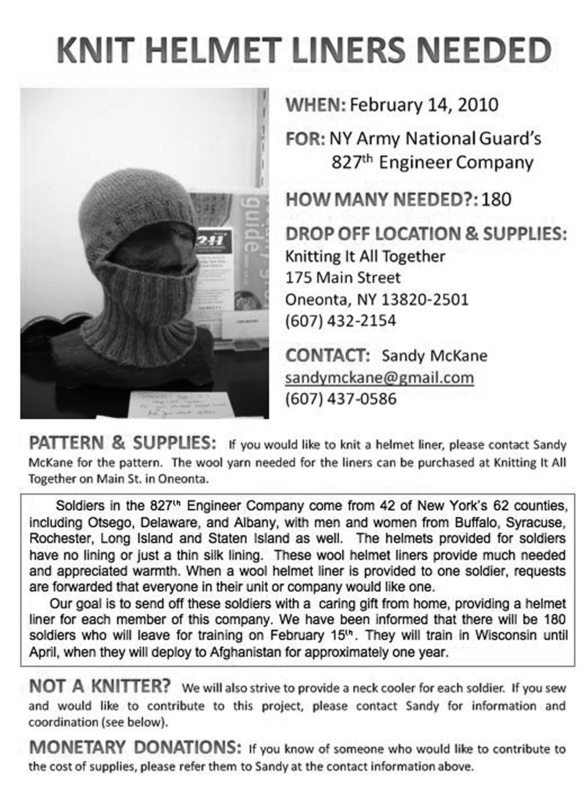 Over the summer, I continued to reach out to a variety of military offices to find another company, as many knitters continued to make helmet liners. When I went to the website we used for patterns, the project was no longer listed, as the military was going to begin supplying helmet liners made of a wicking material. While this was good news, as all service personnel would benefit, the additional option of the handmade item would promote community awareness and support for those serving in the military. Identifying all the preliminary steps to inform and organize, incorporating information and perspective from family members, knitters, soldiers, and others. Making contacts, interviews, creating flyers, distributing patterns, maintaining communications, knitting the liners, sewing the neck coolers, and collecting and distributing the liners. So many moments for reflection occur as information and perspective from within the realm of the military surfaces and responses come from a variety of community members and knitters from different generations. Giving the helmet liners to the soldiers at their departure ceremony, sharing the photos of all the helmet liners collected, the National Guard ceremony description, and responses from military family members with all the knitters. With a checklist of national and global service projects and a base of service learning in our schools, we would also come to know of the value of knitting programs in schools, programs that occur during recess and after school. We could turn to Seth Boyden Elementary School in New Jersey for model components to start a program for knitting in elementary school, discovering the community-building outcomes they have found that affect the overall school environment. In the global checklist, we would find examples of knitters coming together for employment and also as an activity that promotes healing in the aftermath of intense conflict. The implications in both realms point to the commonality of knitting as a calming, constructive, community-building activity that promotes intergenerational relationships. Joe, the original National Guard Soldier, returned to our home community in his professional role as a city police officer. I see him from time to time—in uniform or as a civilian. When we make eye contact, I always feel a moment of recognition—of a caring connection that he and I will always share. Without my service involvement, this perception would not exist. This is the type of moment in my life when I feel value in my presence on earth. Sandy, Thank you for sharing this article about the helmet liners for the Troups. Our knitting group in Gilbertsville was involved in knitting some and felt good that we could provide in a small way for those who do so much for our country. Thank you for making it possible.